MGT Capital Investments (OTCQB: MGTI) A Buy at these levels, or a continued Bust? MGT Capital Investments (OTCQB: MGTI) has plummeted more than 60% in the past one month to $2.56 (at the time of writing) from highs of $7.10 on December 19th 2017. Although it is tempting to buy the stock at the current lows in the hope of a short-term recovery, MGTI is a stock to watch from the sidelines. From an operational perspective, the company severely lacks strategic focus. In less than five years, it has metamorphosed from an online gaming company, to a cyber security firm and, as of last year, styles itself as a cryptocurrency mining firm—all this without ever generating a single cent in profits. As of 30th September 2017, it had an accumulated deficit of $355,057,000, according to its 10-Q report. This accumulated deficit—which is simply the total losses it has incurred since inception—is close to triple its market cap of $124 million, underlining the limited viability of its underlying business. Since MGTI is deep in the red, it primarily relies on debt and equity instruments to fund operations. This strategy, which consists of issuing common stock and convertible notes, has a dilutive effect on common shareholders. To cite one example, MGTI sold $2.3 million in convertible notes in August 2016. By August 2017, a year later, these had all converted to stock at a conversion price of $1 per share and $0.75 per share, allowing investors to offload the shares at a premium to their cost to the public. The whole process resulted in the creation of 2.5 million shares. This is just the tip of the iceberg. If you patiently go through the 10-Q report you will identify many other similar arrangements that cannot be exhaustively listed in a single article. These include convertible notes issued in August 2017 and September 2017 as well as significantly huge common stock issuances. All these lead to the creation of new shares without any change in the company’s overall value, leading to share dilution. To understand how share dilution works, imagine you had to share one pie with three of your friends; each of you would get a quarter. If four more friends joined the party and you now totaled eight; each would get an eighth of the pie. While the size and value of the pie, at a whole stays the same, the size and price of each piece will become smaller. A blow-by-blow analysis of how MGTI’s financing strategy dilutes shareholders is not necessary as the company itself disclosed the extent to which it is willing to dilute shareholders to raise money at its AGM on December 19, 2017. During the AGM, shareholders voted on 6 of issues, including two proposals that laid bare the company’s readiness to dilute shares by more than 150% in the next couple of years. 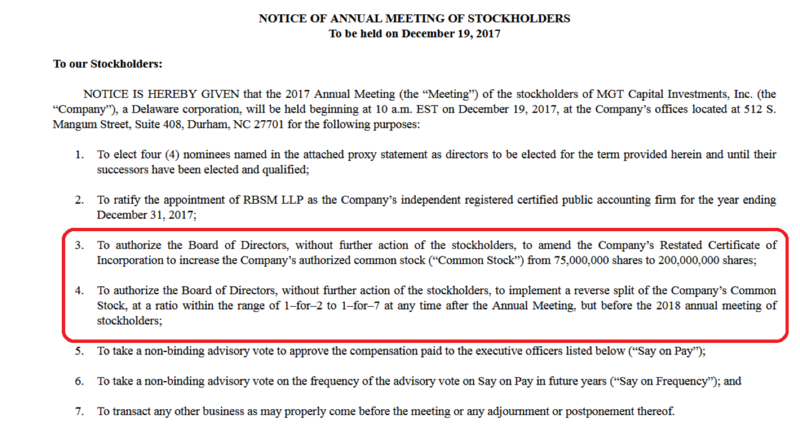 Fortunately for shareholders, these two proposals did not sail through—though MGTI created the impression that shareholders supported the move. The company initially issued a press release saying shareholders approved all proposals presented during the AGM, but later had to clarify in a subsequent press release that this was not the case due to procedural technicalities during voting. “Due to an error describing voting procedures in our Proxy Statement, the Company has decided to reject the approvals of two proposals (increase in authorized shares and reverse split),” the company said. If these proposals had been approved, the company would have moved to dilute common stockholders by at least 150% in the next couple of years—in line with the proposed increase of authorized shares from 75 million to 200 million. The company would then effect a reverse split before the 2018 AGM, leading to the merger of existing shares into smaller more valuable shares without an increase in the overall value of the company or the overall value of shareholders’ portfolio. This would ensure that it doesn’t trade at sub-penny levels, despite massive share dilution. Meanwhile, the only people who would make real money would be convertible note holders and other equity financiers who accumulate the company’s stock at a discount to the market price and later offload them to the public at a premium. Evidently, MGTI is anything but investor friendly. How did a company that was once the most hotly traded stock in the U.S. end up in this position? As stated at the beginning of the article, MGTI lacks strategic focus. Its casual shift from one line of business to another every other year betrays the fact that its true focus has never been online gaming, cyber security or cryptocurrency mining (its current operational area of focus). Its primary focus is raising funds, even if it means diluting existing shareholders or neglecting its core business. The company’s inability to commit to its core business was actually the reason why it was delisted from the NYSE in October 2016. At that time, regulators determined that MGTI was no longer an operating company after it sold its online gaming business, draftday.com. The delisting was meant to serve as a wakeup call for the company to streamline its operations, but things appeared to have worsened. MGTI recently announced that it had ended its business relationship with controversial cyber security pioneer John McAfee as part of its transition to a pure play cryptocurrency miner. The engagement with McAfee, which started in 2015, has achieved little for MGTI in cyber security except creating sufficient publicity (because of McAfee’s reality TV lifestyle) to trigger high volume trades for the stock. For the better part of its engagement with McAfee, MGTI was embroiled in litigation and settlement with Intel (NASDAQ: INTC) over the use of McAfee in its company name and corporate communications. Intel, which acquired McAfee for $7.68 billion in 2010, was more invested in the McAfee name. It was certainly a no brainer that it would win legal rights to use the name. Moreover, all the plans MGTI had with McAfee, including plans to make him CEO and Chairman, fell through. Though McAfee is a seriously talented cyber security professional, any risk manager would advise against having him as a business partner, given his litany of controversies. Even INTC, despite using his name, has never been keen on involving him in day to day business operations. MGTI couldn’t be so lacking in foresight on all these issues, heightening the possibility that McAfee was brought on board for the sole purpose of giving the stock much needed visibility to spur trading volumes and drive analyst coverage. Now that McAfee is no longer useful to MGTI’s broader objective of driving publicity, it has cast him aside and reinvented itself as a cryptocurrency miner. This is part of its publicity playbook, as Bitcoin and Ethereum are currently great publicity drivers. MGTI styles itself on its website as “one of the top bitcoin producers in North America” but lacks the scale to back up this bold assertion. In its 10-Q report, the company says it had $4.2 million worth of crypto-currency machines at the end of the third quarter. From these assets, it was able to rake in revenue of $1.2 million for the nine months ending September 30th 2017. Though this is commendable, it is still not sufficient to get it out of losses in the foreseeable future. Moreover, since revenue from crypto-currency mining is predicated on crypto-currency price movements, it is difficult to forecast future revenue growth trends. Direct exposure to bitcoin and other cryptocurrencies, especially if it is the sole revenue stream, is an unacceptably high risk in view of digital currencies’ price volatility. Players such as AMD (NASDAQ: AMD) and Nvidia (NASDAQ: NVDA) are better positioned to ride the cryptocurrency wave since they produce chips used for mining. All things considered, MGTI’s business case is weak. This is a red flag, as the long-term driver of any stock’s performance is the underlying business. The company is untested in cryptocurrencies, failed in cyber security and sold its online gaming business at the expense of a trading presence on the NYSE. The only thing it has an established track record of doing well is diluting shareholders. In view of the above, MGTI is a strong sell. We set a price target of $0.8 that will materialize in the next six months or less, especially if share dilution hits high gear.